This one just came out outta sheer boredom. 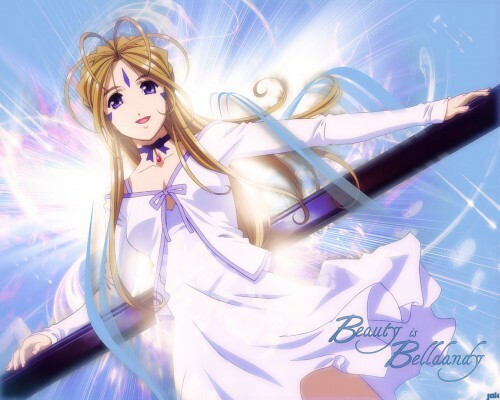 Found this great stock of Belldandy and I started from there. I wanted to give it a "heavenly" feel and I think I've accomplished 78% of that here. First I thought I'd give her a nice sky BG with some soft cloud but that stuff's like old-school and an insult to my mad skillz (hehhe). Anyways, no Zai.... I used Photoshop for this one. None of my extraordinary raster-creation programs. Beautiful doesn't begin to describe it. The light behind her is wonderful, but it looks odd with it's slashing, but it really is nice. Oh, and maybe if the blue wasn't solid? Maybe darkening around the light in the center it would look better. It's Belldandy, so it naturally looks good. Aside of smearing a brown mark across her, she's always going to look great under any light. Either way, bravo to you Jak in showing that you have the Photoshop skills. I'd like to say it's now my wallpaper, but that job always belongs to dirty pictures. She gets her sweet this picture?